I made two daily something layouts today about my chicken. I think they are funny! 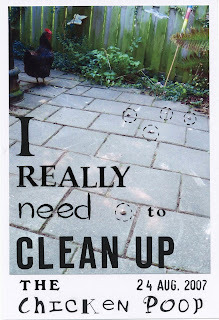 The first one from yesterday is about cleaning up the chicken poop from the terrace. I have to do that several times every day! Because she comes up to the house more often (well she practically stays on the terrace the whole day) there's a lot of chicken poop. It's one of the two inconveniences of having chicken. The second one is that they destroy your garden! 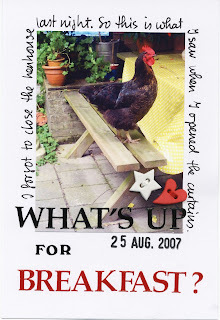 The second layout is about how funny it was to see my chicken sitting on the bench of our picnic table this morning, when I opened the curtains. It looked as if she was waiting for her breakfast. I was a bit surprised too, because normally I close the henhouse every evening, but I guess I forgot to do that yesterday.